Do you like Philly Cheesesteaks, but trying to eat healthy? Great, I got just the recipe for you! This recipe is also great with chicken, shrimp, or tofu. 1. Heat 1 tablespoon of oil in a large skillet over medium heat, then add onion and bell peppers. Season with oregano, salt and pepper. Cook, stirring often, until the onions and peppers are tender, about 5 minutes. Remove peppers and onions from skillet and heat remaining oil in skillet. 2. Add steak in a single layer and season with salt and pepper. Cook until the steak is seared on one side, about 2 minutes. Flip and cook until the steak is seared on the second side and is cooked to your liking, about 2 minutes more for medium. 3. Add onion mixture back to skillet and toss to combine. Sprinkle provolone over steak and onions then cover skillet with a tight-fitting lid and cook until the cheese has melted, about 1 minute. Remove from heat. 4. Arrange lettuce on a serving platter. 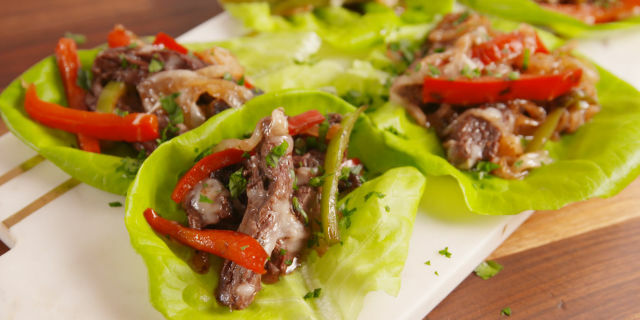 Scoop steak mixture onto each piece of lettuce. Garnish with parsley and serve warm.